Nathankoil also known as Thiru Nandhipura Vinnagaram is one of the 108 divya desams near Kumbakonam. As per the legend Nandhi, the vahana ( the vehicle or carrier) of Lord Shiva, did a penance once here and Lord Narayana appeared before him and hence known as "Nandipura Vinnagaram" and the Lord being called as Nandhinathan. 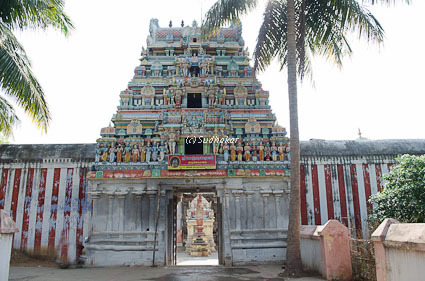 It is also understood that King Nandhi Varman developed this place during his days and constructed this temple. Another story about this place is associated with King Sibhi. The great king Sibhi was very pious and a great philanthropist. The Gods wanted to test him.Lord Indra took the form of a hunter and Lord Agni as a pigeon. The piegon sought Sibhi's help to save him from the hunter. The hunter demanded that he being hungry he wanted the Pigeon's flesh. Sibhi argued with him and offerred his own flesh to the equivant of the pigeon's weight. But no amount of flesh from his body could equal the balance with the pigeon, so he offered his whole body. Seeing his unselfishness and true devotion, Indra and Agni appeared before him and blessed King Sibhi. To see this, Lord Narayana came down and gave darshan to King Sibhi. The Moolavar of this sthalam is Sri Jaganathan. He is also known as Natha nadhan and Vinnagara Perumal. The Moolavar is giving his seva in sitting position facing West. Prathyaksham for Nandi and King Sibhi. 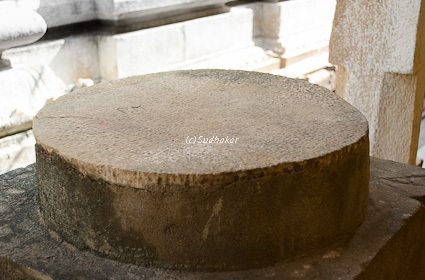 The Thayaar found in this sthalam is Senbagavalli Thaayar. Other Sannidhis: There are sannidhis for Senbagavalli Thayar, Lord Hanuman. 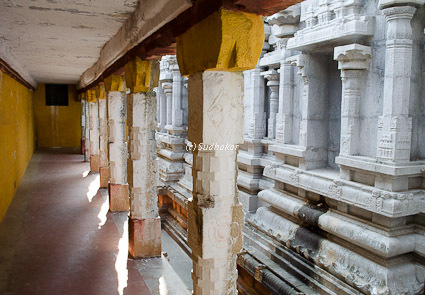 Temple location It is situated around 9 kms from Kumbakonam via a village called Korukkai. Town buses and mini buses are available from Kumbakonam, but please check the bus timings with the bus stand. How to reach? Kumbakonam is well connected by road and train services. Station at Kumbakonam and visit many heritage temples in the surrounding area of within 15 kms radius. Where to Eat?There are no restaurants in Nathankoil. You can reach Kumbakonam for lunch / dinner.